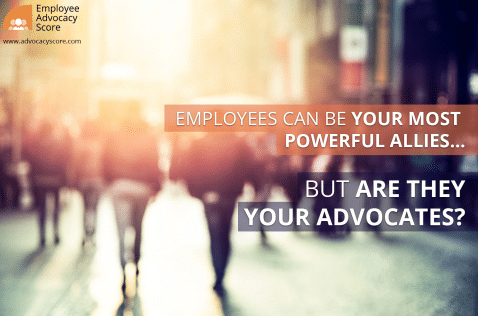 The recent release of the Employee Advocacy (EA) Score, which ranks the top Fortune, FTSE and CAC 40 companies on employee advocacy, has provided some pertinent insights into the real impact CEOs have on employee advocacy at their company. Created by Sociabble, the EA Score uses a combination of metrics to determine a score between 0 and 100. The higher a company’s employee engagement and advocacy level, the higher their EA Score. Data taken into consideration includes the social media activity of company CEOs. The activity of CEOs on social media is one of the metrics used to determine a company’s EA Score. When isolating CEO scores (a measurement of 0 to 6), we see that there is a low level of CEO activity on social media. This is an interesting point to note, as a lot is said about the importance of CEOs being social, and the impact this has on both company culture and business results. The following table shows the average CEO scores for all companies, for companies using an employee advocacy tool, and for companies that do not have a tool but do have a socially active CEO. Employee Contribution (EC) scores are another metric taken into account when calculating companies’ overall EA scores. The following table shows how the average EC score varies according to the presence of an employee advocacy tool in place, and the level of CEO social media activity. The first thing to note is the correlation between the activity of CEOs and EC sores at companies with an employee advocacy tool. The highest average EC score is that of Fortune companies (48). However, the impact of CEO activity is most pronounced among FTSE firms. There is an 11 point increase when compared to companies that have an employee advocacy tool, but no CEO involvement. For Fortune and CAC 40 companies the impact of CEO activity is far less evident, which may indicate that it is mid-level management, rather than the CEOs, that champions the majority of employee advocacy programs. For companies with no employee advocacy tool, the impact of CEO activity is most marked among CAC 40 firms. Here the average EC score rises from 11 to 18. On the contrary, for FTSE companies, the average EC score is marginally higher when there is no CEO involvement. This discrepancy is minor. It may reflect a present yet low level of CEO activity. This, in turn, has a negligible impact on employees’ engagement in advocacy. For companies where an employee advocacy tool is used, the average CEO score is much higher than it is at those companies where no tool has been launched. This is a noteworthy finding. Companies with socially active CEOs are more likely to achieve the backing required to launch an employee advocacy tool. Furthermore, this data demonstrates the trend that an employee advocacy platform enables your workforce to be more engaged. Contact us to find out more about your Employee Advocacy Score.